As we continue to prep our food beds for the winter and ramp up the greenhouse production of lettuce, I’ve been spending more time on inside projects, particularly a new writing project. I’m co-creating a Prepared Neighborhoods book with the public (consider yourself invited!). I’m convinced the neighborhood is where the sustainability movement meets emergency preparedness. Making my own cayenne pepper from the peppers I finished ripening in paper bags. Never tasted better hot peppers for my eggs each morning. Finding the Insurance Information Institute’s emergency plan mobile app. Awful brand name, excellent app. Completed CERT training after nine months, which gave me an excuse to experiment with combining a desire to lead a simplified life while still being prepared. My CERT backpack is a great example of how to leverage multifunctional items to equip yourself to handle a wide variety of situations while still keeping the pack simple and light enough to lug around all day for several days. Backpack contents listed below. 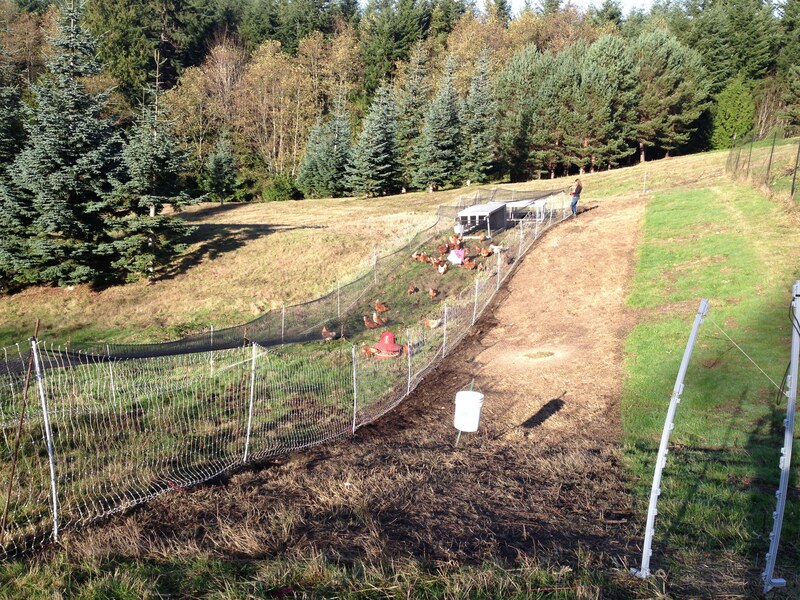 Left to right: new pasture, last month’s pasture, previous month’s pasture. The ground recovers in about three weeks. Battling Seasonal Affective Disorder – a fancy way to saying these damn winter clouds make me miserable – but I’ve found additional remedies that work well, such as a Mustard Flower tincture and doing hot yoga (stretching in a 100 degree room will warm up anybody!). Top row: bandages, first aid kits, trauma hemorrhaging kit, kneepads, gloves, CERT vest (above), P100 mask, googles (two pair), headlamp, helmet. 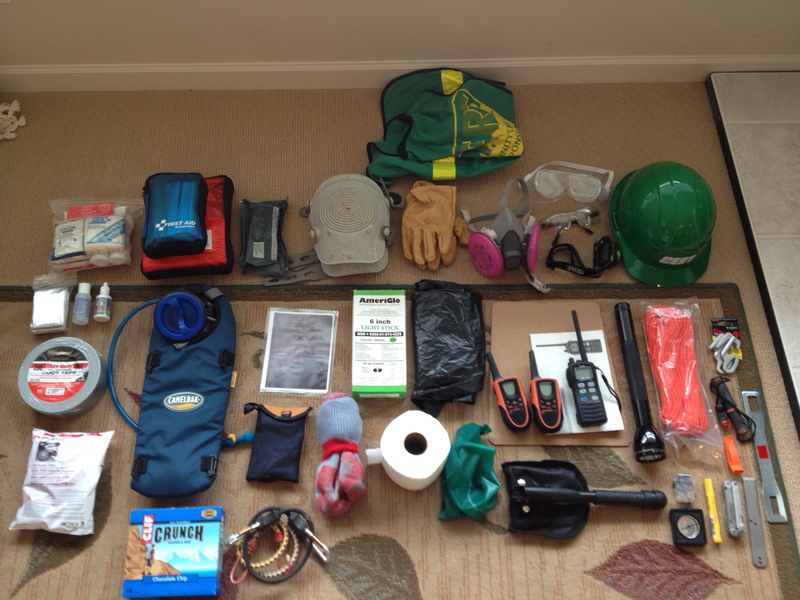 Middle row: emergency blanket, hand sanitizer liquid, Ko7 water purification drops, Camelback water bladder, laminated cheat sheet for how to mark doors, glow sticks, large garbage bags, walkie-talkies for team, Icom BC-166 2-way radio to talk to BIFD, large flashlight, bright orange paracord, Figure 9 rope tighteners, two emergency whistles, one with fire steel (below). Bottom row: duct tape, P100 replacement filters (below), snack bars, bungie cords, microfiber camp towel (above), dry socks, toilet paper (below), large green rubber band to keep doors open behind us, multipurpose camp tool (Emergency Zone brand), lighter, compass with signal mirror, marking crayon, Leatherman tool, pry bar, utility turn-off tool. Additions not in photo: vice grips to keep doors locked open, sterile eye drops, additional seasonal clothing, fresh batteries for everything including my two EDC (everyday carry) flashlights, backup gloves, ID cards on lanyard, small bills of cash. And I still have room to throw in more food (I get hungry often! ).